Andrew M. Smith II is an Associate Professor of Classics and History in the Columbian College of Arts and Sciences at the George Washington University. Smith specializes in the history and archaeology of the Hellenistic, Roman, and Byzantine Near East. His research focuses on processes of community formation and urbanism in the Roman and Byzantine Near East, with an emphasis on Arab communities. His most recent book, for example, Roman Palmyra: Identity, Community, and State Formation (Smith 2014), examines the “making” of Palmyrenes and the development of Palmyra (Syria), into a classical Mediterranean city. Prof. Smith also has a long-term interest in Nabataean, Roman, and Byzantine Petra (Jordan), where his research interests target social and economic activity in rural settings as well as the integration of cities with their hinterlands. 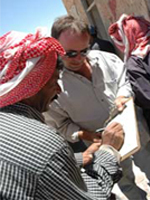 Prof. Smith has worked in Jordan since 1993 and has been involved with and directed numerous archaeological surveys and excavations. Currently, he directs the Bir Madhkur Project and the Bir Madhkur Incense Route Project in southern Jordan, in the hinterland of Petra. In addition to supporting his research interests, both of these projects focus on the challenge of preserving Petra’s regional, cultural heritage through community engagement. In support of his work, Prof. Smith has received funding from the Loeb Classical Library Foundation at Harvard University, the Royal Geographical Society of Great Britain, National Geographical Society, the American Schools of Oriental Research, the Explorers Club, the American Center of Oriental Research in Amman, Jordan, Dumbarton Oaks, USAID, and GWU. Professor Smith has previously served the American Schools of Oriental Research (ASOR) as Co-Chair as well as an elected member of the Annual Meetings and Program Committee, the Finance Committee, and he currently serves on the Committee on Archaeology Policy. He has also served the Archaeological Institute of America (AIA) as co-Chair of the Near Eastern Archaeology Interest Group as well as co-Chair for the local Washington DC AIA Society; he is currently a member of the Near Eastern Archaeology Interest Group of the national AIA as well as a member of GW’s Capitol Archaeological Institute. Prof. Smith teaches a range of courses at GWU that attract students from across the various schools and programs at the university. In addition to a Roman History survey that he teaches each Spring, Prof. Smith alternates each Fall and teaches either Warfare and Diplomacy in the Ancient World, the Ancient Economy, or Ancient Identity: Greeks, Romans, and Others. He also teaches introductory Latin throughout the year.